Thrilling paintball action on the Eastside – sign up with Delta Force! If large-scale epic props, awesomely themed game zones and immersive mission scenarios are your thing, then a paintball day at Delta Force Paintball in Essex will be right down your alley (Chemical Alley, to be more precise!). 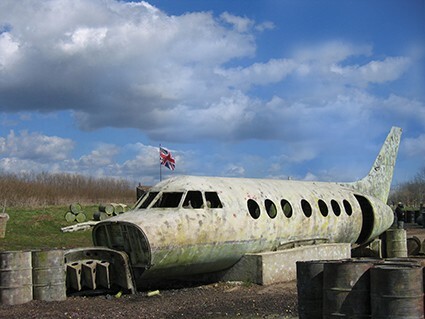 Storm a jet fuselage to free captured hostages in the action-packed Jet Hijack; keep a double-decker bus in lockdown and defend against enemy fire in London Bus; or come up with a game plan to defeat the zombie forces in the Haunted Graveyard – this is how paintballing in East London should be done! For many keen paintballing folk, it is the joy of wielding a slick semi-automatic paintball gun that gives them that extra buzz on the battlefield. We are proud to supply top of the range paintball guns powered by HPA as well as replica M16 upgrade guns, both highly accurate and reliable with the latter having the added advantage of a built-in sight, extended barrel, customisable stock and removable magazine. 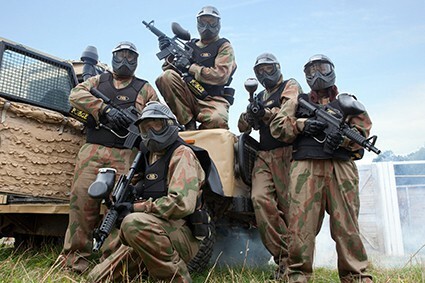 Along with awesome paintball pyrotechnics, riot shields and other equipable gear for hire (battle packs and body armour), our paintball safety equipment is unrivalled in the paintballing industry. We don’t do things by half-measure! Spend a day at Delta Force Paintball in East London and you will soon find yourself in more heated duels than the cast of Eastenders! It is all good-natured fun of course, but there is nothing wrong with a little friendly rivalry – there are points to acquire, not to mention awards to be handed out at the end. Think you got what it takes to be the hotshot?